The importance of friends and family to our health is well understood by American Indians and Alaska Natives (AI/AN). Though the specific traditions of tribes, pueblos, nations, and bands can differ quite a bit between one another, we as AI/AN share our respect for, inclusion of, and focus on Elders as a common link between our communities. In today’s culture, many Elders are separated from their communities and therefore from some of this tradition. While we may overlook it, the connections with our families and friends are important to our health and wellbeing as Elders. 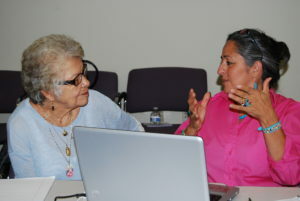 Research is demonstrating the importance of social interactions to the physical and mental health of Elders, but Elders may face challenges maintaining relationships for a variety of reasons. Research has shown that visiting with friends and family can mean a lot more for Elders than having a good time. Elders who have more of what is known as “social capital” may have better health than those who do not. “Social capital” means the connection, trust, and participation an Elder has with their community. Elders who live in areas where they have high social capital have much better mobility than those who do not, as having trust in the safety of the community and living near neighbors who are willing to help can make them feel safer to walk around and spend time outside of the home. moderate social involvement which increased over time. While not a guarantee, it is clear that social interaction and connections with friends and family are very much an important part of an Elder’s health, even if the exact reasons why are still not yet known and are being researched. But it does seem clear that an Elder surrounded with friends and family is one who is helping to maintain their own health, as well as the health of those around them. For AI/AN Elders, the community and its traditional events can help keep one engaged with friends and family because of the important role we play in our traditions. For those living outside of traditional communities in the cities or suburbs, however, becoming disconnected from people may be easier. There are a number of different ways in which an Elder can increase their social activity and engagement to help support their own health and that of others. Well-known social media sites like Facebook.com, which are easy to use and can help Elders new to computers to become more familiar with the internet. Facebook is best known for connecting family and friends, but it also has social groups based on interests and hobbies as well as groups supporting a cause or political interest. It is the largest social network ever created, with one billion users worldwide. While the internet makes it easy to connect with others, there are many ways to connect with others and stay socially active offline too. 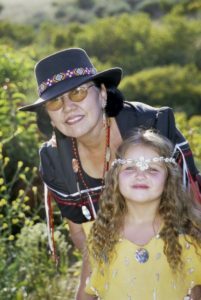 Community and traditional events are a great way to stay engaged with friends and family, and to help pass on sacred traditions to the young ones. Local resources like libraries and senior and community centers often have fun or educational events that may be of interest. Book clubs, line dancing, financial planning workshops, painting, billiards and board games – there is something for just about everyone!. Your local Area Agency on Aging provides free and low-cost meals for Elders. This is a great way to share a meal and converse with others and meet your nutritional needs as well. Volunteering to help a cause is a great way to help other people, the community, and meet others with similar interests. You can reach out to local nonprofit groups, volunteer programs such volunteer match or elder helpers, or national organizations to see if they need help. Hosting events for your friends and family can encourage everyone to come and visit, and have fun.